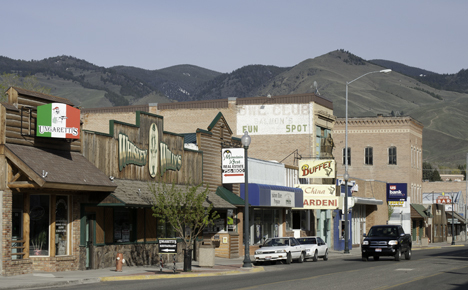 Salmon, the seat of Lemhi County, calls itself the "Whitewater Capital of the World", and it is the region's major gateway to mountains, mountain lakes and streams, rivers and national forests. There are many guides and outfitters with various specialties including hunting, fishing, rafting and horse-packing who can take you into the back country. As its name suggests, the town of Salmon lies in a prime wild-river fishing region. Dubbed the "River of No Return" by Lewis & Clark, the Salmon River is one of the few un-dammed rivers left in North America. From June to September, Chinook salmon spawn in the gravel beds of the river in tremendous numbers, although numbers have been declining in recent years. As well as salmon, the rivers have good stocks of rainbow trout and steelhead. Winter visitors enjoy snowmobiling and cross-country skiing, with forest trails all around town. Salmon got its start as a point where men and supplies were ferried across the Salmon River, in order to get to the gold fields of Leesburg, 16 miles to the west. Soon after the height of the mining "boom" in 1867, Colonel George L. Shoup, a prominent businessman and future state governor, instigated laying out the town site. Chinese miners were prominent, and the town had its own "Chinatown". Many of the miners returned to Salmon and the surrounding valleys, took up land, and began ranching. Lumber also became an important industry, and the town of Salmon continued its growth and development. Salmon has kept some of its flavor as a frontier town of the West.